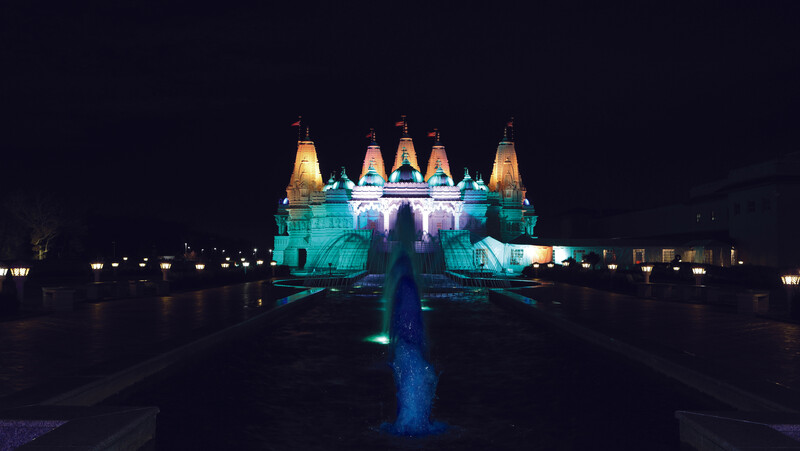 The Swaminarayan temple in Bartlett, Ill. celebrated Diwali Oct. 31, 2016 with prayers, annakut offerings and colorful intricate designs called rangoli and a spectacular light and sound show. 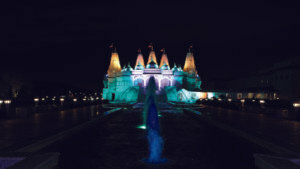 Diwali is a joyous festival of lights, celebrated by Hindus, Jains, Sikhs, Buddhists (Dharmic traditions) and the festive spirit expressed by those of “any, all and no faith.” Though celebrated for different reasons, it has evolved from a pan-Indian festivity uniting multicultural diversity with worldwide cultures. Hinduism is the contemporary word used for the monotheistic “Sanatana Dharma” or Eternal Order. The joy and peace in human life is based on observance of this eternal order. In the Hindu approach, an integration of spirit, mind and body is emphasized for pursuit of happiness (ananda). Festivals play a very important role in Hinduism as they manifest this integration. In bringing together people of all Indic traditions — Hindus, Jains, Sikhs, Buddhists and others — the celebrations of the different aspect of Diwali create an interlocked mosaic. Most of Northern India celebrates the homecoming of King Rama of Ayodhya after a 14-year exile in the forest with his wife Sita and brother Laxman. The people of Ayodhya (metaphorically translates to a place of no war) welcomed the trio by lighting rows (avali) of lamps (deepa), hence the name of the festival, Deepavali, or Diwali. The celebration of the victorious return of Lord Rama to Ayodhya after killing the demon Ravana signifies the spiritual fulfillment of the journey (of life) after destroying the evil forces (asuras — negative tendencies) and strengthening the divine (divya) forces within. For Jains, Diwali has an added significance. Lord Mahavira attained the Eternal Bliss of Nirvana. His lifewas transformed into a spiritual journey of self penance and sacrifice. Subhe Morning il. Buddhists in India and Nepal honor Emperor Ashoka who, on this day, took to Ahimsa (non-violence), a key Vedic principle which became an integral part of Buddha’s teachings. King Ashoka sent his emissaries to many part of Asia and they spread Buddha’s teachings. Goddess Lakshmi, (from the Sanskrit word “lakshye” which means “aim”) is invoked for blessings to restart our worldly and spiritual accounting. Prayers of thankfulness, (Lakshmi Puja), are offered for future prosperity by people of all faiths. Lakshmi Puja is another common factor in Diwali celebrations which binds the people of the Indian subcontinent and now globally. Deepavali literally means a row (avali) of lights (deepa) or Diwali. While the story behind Diwali varies from region to region, the essence is the same: to rejoice in the Inner Light and understand the underlying reality of all things. The spiritual meaning of Diwali is “the awareness of the inner light.” At the heart, Hindu philosophy emphasizes the presence of that which is pure, infinite and eternal, which is something beyond the physical and the mind. Diwali is the celebration of the awakening and awareness of the Inner Light. Although it is not seen externally, this Inner Light outshines all darkness, removes all obstacles and dispels all ignorance; it awakens the individual to one’s true nature, not as the body, but as the unchanging, infinite and transcendent reality. As this budding inner realization flowers then there is universal compassion, love, and the awareness of the oneness of all things. — The Sat (Truth), Chit (Consciousness) and Ananda (Inner Joy). For Hindus, this is the goal of life. 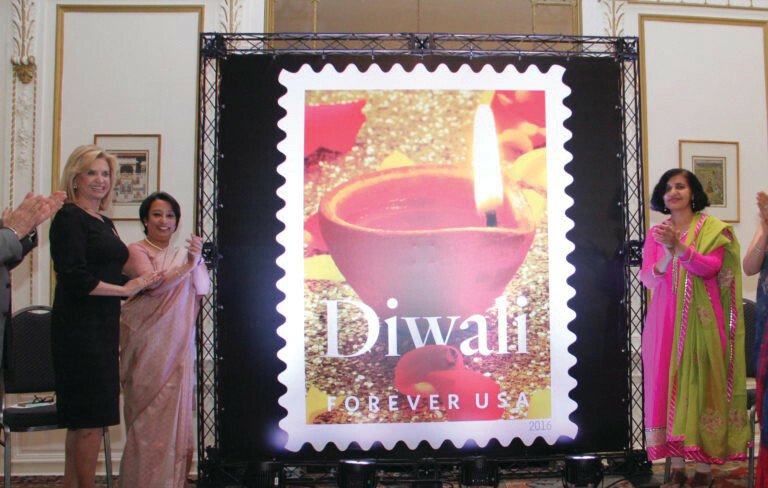 A number of Indian-Americans crowded into the Indian Consulate in New York Oct. 5, 2016 to witness the formal unveiling of the first Diwali “Forever” stamp released by the U.S. Postal Service. Diwali unifies every religion, every home and every heart, and India transcends into a land of myriad lamps. Here in America, we are continuing this celebration marking it as a unifying pluralistic festival advancing community service. We hope Hindu and Dharmic traditions of Diwali and America’s commitment to service will illuminate innovative and empowering resources, both financial and spiritual and spur the distribution and sharing of common values of pluralism and collaboration. We hope as you celebrate and share the message of Diwali, the victory of light over darkness and knowledge over ignorance, with your friends, family and neighbors, you will be inspired to help those who need. You will bring UtsavSeva to action! We wish you a very Happy Diwali and a New Year filled with health, happiness, peace, prosperity and seva this festive utsav. With grateful hearts we thank you for your support and blessings. 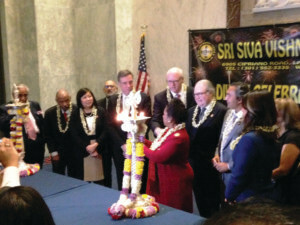 More than 150 lawmakers and members of the Indian-American community attended Diwali celebrations on Capitol Hill Nov.19, 2014 organized jointly by the Congressional Caucus on India and Indian-Americans and the Sri Siva Vishnu Temple of Greater Washington, D.C.
What Is UtsavSeva And What Does It Aim To Achieve? A strategic initiative to encourage people of all Dharmic and Hindu sampradayas (congregations) and eastern traditions to perform “UtsavSeva”, as appropriate. 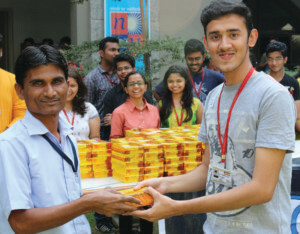 It aims to maintain the spirit of the many Utsavs and their values based Seva roots. 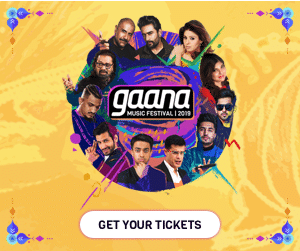 Why Relate Festivals With Service? Every Utsav offers us an opportunity to offer service to those among us who are in need. Utsavs play an important role in expressing the spiritual significance in celebratory ways while bringing people together. Dharmic culture encourage service during holy days/festival days. The strength of the culture is the many ways in which the Puranic (ancient traditional) stories and epics are brought to life through festivals. UtsavSeva is community service augmenting the spirit of Dharmic festivals through seva events organized during every festive occasion and cultural heritage. Who Should Participate In UtsavSeva? Communities, whether secular or faith based cultural associations and organizations, homes, schools, temples, ashrams, spiritual centers, yoga ashram and studios to take the lead in organizing seva events invoking the spirit of the festivals. HASC has developed theme based seva resources/toolkits to bring awareness of the festivals, contemporary relevance in our life and ways to learn and inspire each other. UtsavSeva is designed keeping in mind service projects that aim to celebrate the broader messages from festivals celebrated across religious lines and national days of service in the United States. For example, in December, people of eastern tradition do not have a festival, however HASC suggests SarvaDharmaSeva – Interfaith service – in which the Dharmic people continue to foster respect and understanding. How Do You Put UtsavSeva Into Action? Take the underlying meaning of the festival to provide values based service with positive impact. Example: Holi is a celebration with color representing equality and joy. These values can be highlighted through different forms of seva. Example: Navaratri is a celebration to honor the many aspects of feminine strength. Highlight these values during the celebrations via dialogues, sharing stories, or helping women’s organizations. Example: Diwali celebrates removal of ignorance with the light of knowledge, triumph of goodness over evil and honoring Lakshmi, the deity of wealth and resources. DhanSeva amplifies the message of resource empowerment to do seva projects, which promotes these values through education, economic help job fairs, and hunger – canned/boxed food to replenish local food banks for Thanksgiving, etc. 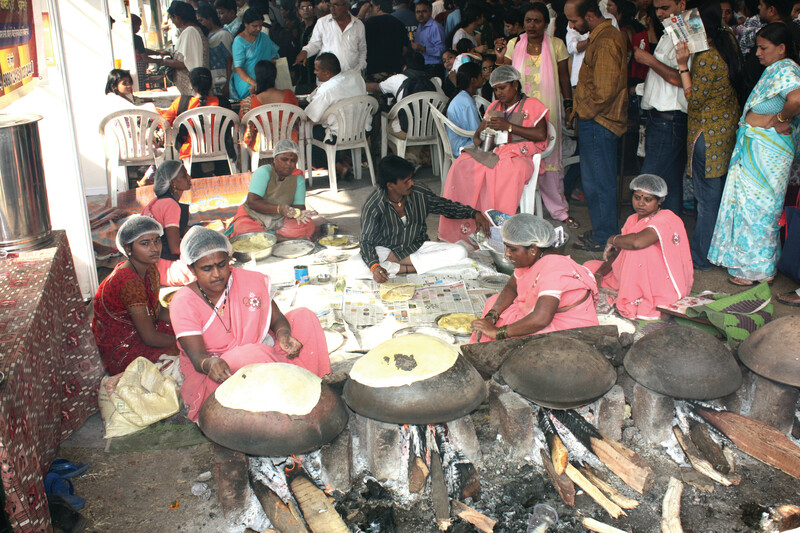 Our ancient rishis (seers) incorporated charity (daanam) in each of the festivals and encouraged the community to serve; Seva is an intrinsic part of our Sadhana (spiritual practice). HASC’s year round, contemporary Dharmic interfaith UtsavSeva is a new concept which was conceived by Anju Bhargava and developed with HASC’s many volunteers. It is a living framework and is constantly being improved upon to include lessons learnt from its volunteers and the community. 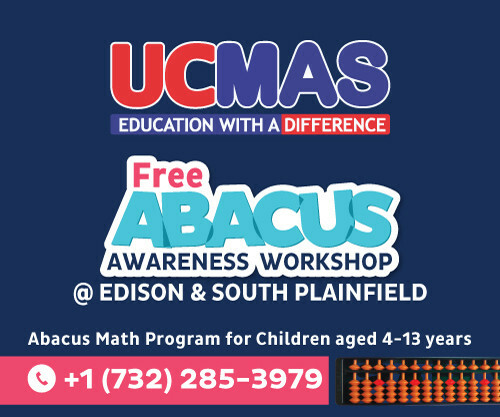 We welcome your suggestions to improve and expand this initiative!